First thing’s first (I’m a realist?) sooo sorry it’s been TEN days since I last posted. I have been living in one hell of a wisdom tooth nightmare and the general pain/swelling/representing a sad potato meant that blogging was pushed aside as a priority for a bit. 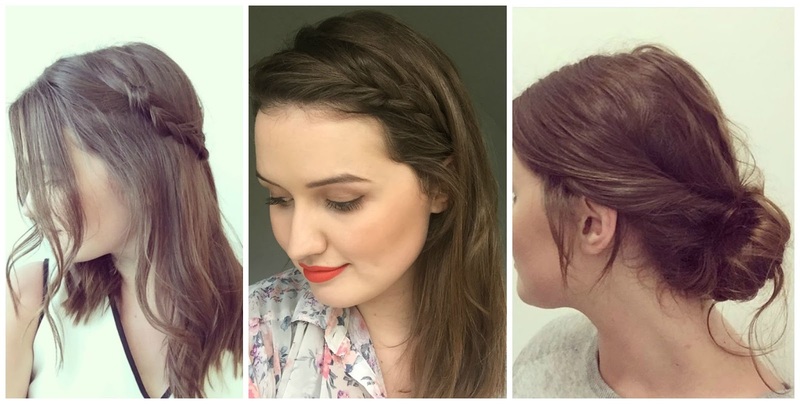 I thought I’d do something a little different and share a few simple hairstyles with you. I have naturally bushy, curly and frizzy hair so am a slave to the GHDs, but it’s still unruly and I can’t really experiment too much with styles so these are basic offerings you can do in ten minutes in the morning. The first (left to right) is probably the simplest. I start by pulling a few strands out around the edge of my face and then grab a bigger section behind the strands and plait, pulling backwards round the back of my head as I go and fasten with a bobby pin. I do the same the other side and then loosely curl the rest of my hair using my straighteners for a bohemian vibe – it’s definitely a look that would benefit from some daisies as a garnish but not for the office eh? The second is an all fingers and thumbs-type operation but easy with a bit of practice. If you have a centre parting like me, section the front two inches into a side parting and then pull the hair to the side while plaiting. Pick up strands on your hairline as you go to make it extra secure and fasten with a bobby pin behind your ear. As you plait, try and start by pulling the hair closest to the hair line into the plait first so it pulls away and stays out of your face. The third is my greasy hair day saviour. Section three inches of your hair at the front and twist by your ear, making sure to twist inwards away from your head (or you end up looking like a flan). Complete on both sides and pin in places and then scrunch the remaining hanging hair into a messy bun. Easy peasy. I like this to look a little scruffy so pull some strands from the bun and down by my ears. Yeah, so simple and sophisticated! Like your ideas, especially the second one. I`m in love with beautiful and simple hairstyles suitable for every day.